World War II (WWII), also called the Second World War, was a global war. It took place from 1939–1945. Most of the world's countries, including all the great powers, fought as part of two military alliances: the Allies and the Axis. The war was fought as a "total war", meaning all resources a country had were used in the war, even those that didn't belong to the army, such as factories. It involved more countries, cost more money, and killed more people than any other war in human history. Between 30 and 50 million people died. The majority were civilians. The start of the war is usually said to be the German invasion of Poland on 1 September 1939. Some sources count the Japanese invasion of China on 7 July 1937, as the start. The United States reacted to the Japanese invasion of China by placing an embargo on Japan. France and Britain reacted to the German invasion of Poland by declaring war on Germany. By 1941, most of Europe was under German control. 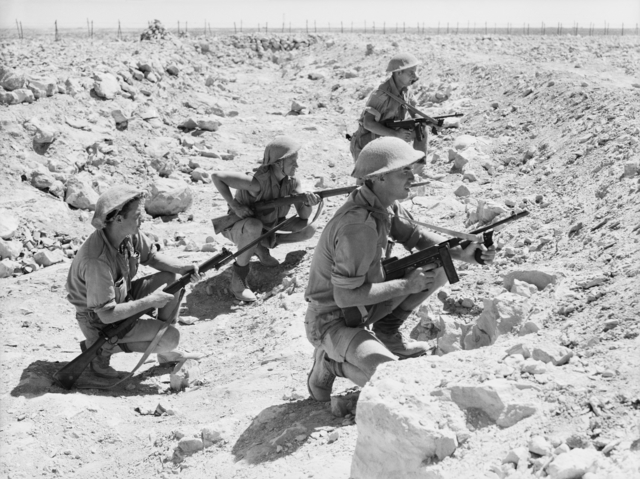 Only Britain remained fighting against the Axis in North Africa, the Mediterranean, and the Atlantic. In June 1941, the Axis Powers invaded the Soviet Union, starting the largest theatre of war in history. This would harm the Axis military power greatly. In December 1941, Japan attacked Western colonies in the Pacific. The Japanese victories were stopped in 1942, and the European Axis victories were also stopped by 1943, both in North Africa and in the Soviet Union. After that, the Allies started to fight back from all sides. The Axis lost North Africa and, starting in 1943, were forced to defend Italy. In 1944, the Allies invaded France, heading towards Germany, while the Soviets kept closing in from the East. Germany surrendered in May 1945. Japan formally surrendered on 2 September 1945. The war ended with the Allied victory. 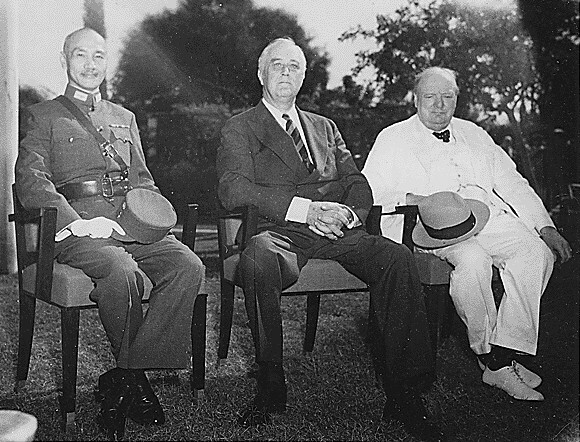 After the war, the United Nations was set up to develop support between countries and to prevent future wars. The Cold War took place between the two superpowers, the Soviet Union and the United States, but they did not fight each other in an actual war. Decolonization of Asia and Africa, where those countries controlled by European countries were given their independence, happened as well. This was because European power was weakened from the war. Economic recovery and the political integration (the process of uniting countries) were among other results of the war. The Axis Powers at the start of the war were Germany, Italy and Japan. There were many meetings to create the alliance between these countries. Finland, Slovakia, Romania, Bulgaria, Hungary, and Thailand joined the Axis later. As the war continued, some Axis countries changed to join the Allies instead. The Allied Powers were the United Kingdom and some Commonwealth members, France, Poland, Yugoslavia, Greece, Belgium and China at the start of the war. In June 1941, the Soviet Union joined the Allies, after Germany attacked it. On 11 December 1941, four days after Japan attacked Pearl Harbor, the United States joined the Allies. World War I had greatly changed the way of diplomacy and politics in Asia, Europe, and Africa with the defeat of the Central Powers. Empires which sided with the Central Powers were destroyed. The Russian Empire, which did not side with the Central Powers, died as well. The war also changed the borders in Eastern Europe, with many new countries born. The war led to strong irredentism and revanchism in Europe. These senses were especially strong in Germany, which had no choice but to sign the Treaty of Versailles. The Germans also had 13% of their homeland area and all colonies taken away, and they had to pay back a very large sum of money to the Allies. The size of their army and navy was also limited, while its air force was completely banned. Lenin died and Stalin succeeded him as leader of the Soviet Union. In March 1938, Germany sent its army into Austria, which had only a little reaction from European countries. Shortly after that, the Allies agreed to give Sudetenland, part of Czechoslovakia, to Germany, so that Hitler would promise to stop taking more land. But the rest of the country was either forced to surrender or invaded by March 1939. 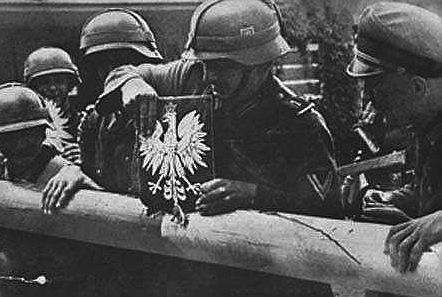 The Allies now tried to stop him, by promising to help Poland if it was attacked. Just before the war, Germany and the Soviet Union signed a peace agreement, agreeing that they would not attack each other for ten years. In the secret part of it, they agreed to divide Eastern Europe between them. 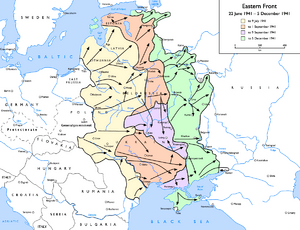 By June 1940, the Soviet Union moved its soldiers into the Baltic States and took over them, followed by some parts of Romania. Although there had been some collaboration between the Soviet Union and Germany earlier, this event made it serious. Later, when the two could not agree to work more closely together, relationships between them became worse to the point of war. Then Germany began an air battle over Britain to prepare for a landing on the island, but the plan was finally canceled in September. The German Navy succeeded in destroying the British ships transporting goods in the Atlantic. Italy, by this time, had begun its operation in the Mediterranean. The United States, which had not joined the war on either side, started to help the Allies. By helping to protect British ships in the Atlantic, the United States found itself fighting German ships by October 1941, although this was not a formal war. In Asia, German successes encouraged Japan to call for oil supplies from the Dutch East Indies. Many Western countries reacted to the occupation of French Indochina by banning oil trading with Japan. Japan planned to take over European colonies in Asia to create a great defensive area in the Pacific which would let it free to get resources. But before any future invasion, it first had to destroy the American Pacific Fleet in the Pacific Ocean. On 7 December 1941, it attacked Pearl Harbor as well as many harbors in several South East Asian countries. This event led the United States, United Kingdom, Australia, Western Allies and China to declare war on Japan, while the Soviet Union remained neutral. Most of the Axis nations reacted by declaring war on the United States. On the Eastern Front, the Axis defeated Soviet attacks during summer and began its own main offensive to southern Russia along Don and Volga Rivers in June 1942, trying to take over oil fields in Caucasus and a great steppe. Stalingrad was in the path of the Axis army, and the Soviets decided to defend the city. By November the Germans had nearly taken Stalingrad, however the Soviets were able to surround the Germans during winter and forced the heavily lost German army in the city to surrender in February 1943. Even though the front was pushed back further than it was before the summer attacks, the German army still had become dangerous to an area around Kursk. On D-Day, 6 June 1944, the Allies began the invasion of Normandy, France. The code name for the invasion was Operation Overlord. The landings were successful, and led to the defeat of the German forces in France. Paris was liberated in August 1944 and the Allies continued eastward while the German front collapsed. On 22 June, the great Soviet offensive, codenamed Operation Bagration, almost destroyed the German Army Group Centre. Soon the Germans were forced to defend Ukraine and Poland. Arriving Soviet troops caused uprisings against German government in Eastern European countries, but all of those failed to succeed unless helped by the Soviets. Then another Soviet offensive forced Romania and Bulgaria to join the Allies. Communist Serbs partisans under Josip Broz Tito retook Belgrade with some help from Bulgaria and the Soviet Union. Operation Market-Garden was the combined aerial invasion of the Netherlands launched on 17 September with the purpose of seizing a series of bridges that ultimately included the bridge at Arnhem which spanned the Rhine itself. Market was the airborne aspect, Garden was the ground invasion itself that ultimately reached the Rhine, not being able to take the bridge itself. In the Eastern Front, on 22 June, the great Soviet offensive, codenamed Operation Bagration, almost destroyed the German Army Group Centre. Soon the Germans were forced to defend Ukraine and Poland. Arriving Soviet troops caused uprisings against German government in Eastern European countries, but all of those failed to succeed unless helped by the Soviets. Then another Soviet offensive forced Romania and Bulgaria to join the Allies. Communist Serbs partisans under Josip Broz Tito retook Belgrade with some help from Bulgaria and the Soviet Union. By early 1945, the Soviets attacked many German-occupied countries: Greece, Albania, Yugoslavia and Hungary. Finland switched to the side of the Soviets and Allies. On 16 December 1944, the Germans tried for the last time to win on the Western Front by attacking the Allies in the Ardennes, Belgium, known as the Battle of the Bulge, which was also the last major German attack of the war, yet it failed every target. But it also made clear that the Allies could not be won in a short period of time, as predicted, because of immense German defense efforts. By March 1945, the Soviet army moved quickly from Vistula River in Poland to East Prussia and Vienna, while the Western Allies crossed the Rhine, and in Italy, they pushed forward, while the Soviets attacked Berlin. The western forces would eventually link up with the Soviets at the Elbe river on 25 April. Hitler committed suicide on 30 April 1945, two days after Mussolini's death. In his will, he appointed his navy commander, Grand Admiral Karl Dönitz, to be the President of Germany. Opposing Hitler's will to have Germany continue fighting, Dönitz eventually surrendered. German forces in Italy surrendered on 29 April. 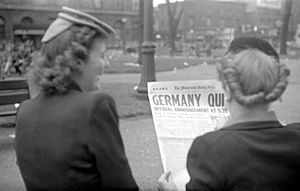 Germany surrendered to the Western Allies on 7 May, known as V-E Day, and was forced to surrender to the Soviets on 8 May. The final battle in Europe was ended in Italy on 11 May. In the Pacific, American forces arrived on the Philippines in June 1944. And by April 1945, American and Philippine forces had cleared much of the Japanese forces, but the fighting continued in some parts of the Philippines until the end of the war. British and Chinese forces advanced in Northern Burma and captured Rangoon by 3 May. American forces then took Iwo Jima by March and Okinawa by June. Many Japanese cities were destroyed by Allied bombings, and Japanese imports were cut off by American submarines. The Allies wanted Japan to surrender with no terms, but Japan refused. The United States then dropped two atomic bombs over Hiroshima (6 August) and Nagasaki (9 August). On 8 August, the Soviets invaded Manchuria, quickly defeating the primary Imperial Japanese Army there. On 15 August, Japan surrendered to the Allies. The surrender documents were formally signed on board the USS Missouri on 2 September 1945, ending the war. In Asia, Japan was put under American occupation. In 1948, Korea was divided into North and South Korea, each claiming to be the legal representative of the Koreans, which led to the Korean War in 1950. 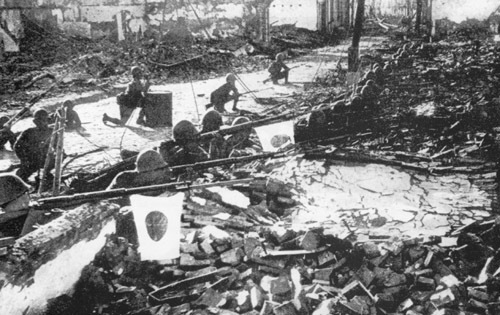 Civil war in China continued fighting in 1946, and resulted with the KMT retreating to Taiwan in 1949. The communists won the mainland. In the Middle East, the Arab disagreement on the United Nations plan to create Israel marked the beginning of conflicts between the Arabs and Israel. The Nazis killed many groups of people they selected, known as The Holocaust. They exterminated Jews, and killed the Roma, Poles, Russians, homosexuals and other groups. Around 11 to 17 million civilians died. Around 7.5 million people were killed in China by the Japanese. The most well-known Japanese crime is the Nanking Massacre, in which hundreds of thousands of Chinese civilians were murdered. There were reports that the Germans and Japanese tested biological weapons against civilians and prisoners of war. As men went off to fight, women were forced to take over many of the jobs they left behind. At factories, women were employed to make bombs, guns, aircraft, clothes and parachutes. In Britain, thousands of women were sent to work on farms as part of the Land Army. Others formed the Women's Royal Naval Service to help with building and repairing ships. Even Queen Elizabeth II worked to aid the war effort. By 1945 some weapons (made in the factories) were run almost entirely by women. In Britain, women also worked in gathering intelligence, at Bletchley Park and other places. Furthermore, the impact of the mass evacuation of children should not be underestimated and had a major impact on the lives of mothers during the war years. Red Army, during the Battle of Kursk, the largest tank battle ever fought. World War II Facts for Kids. Kiddle Encyclopedia.